The 2018 SOAR release party was attended by over 150 people (our best guess) this past Sunday, 26 August. This year’s event was held at McFarland Park, just north of Ames, Iowa. McFarland Park is part of the Story County Conservation Board system. The Conservation Center at the park has a beautiful outdoor setting adjacent to trails and a small lake with the South Skunk River is nearby. The center also has a indoor accommodations for us as well! With the humid day and iffy weather forecast, all but the raptor releases were inside the center. Check out photos from our Facebook Page album. 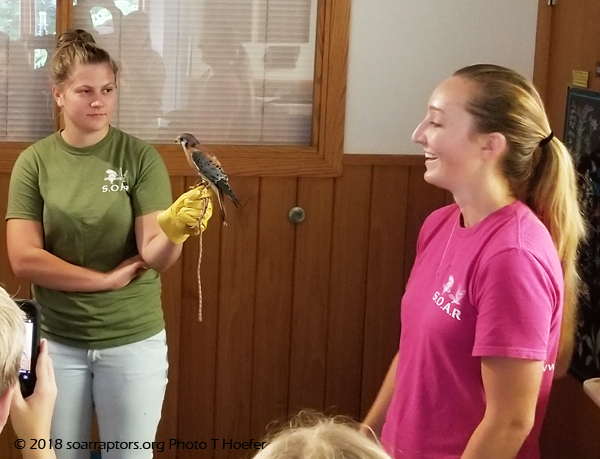 SOAR team members Savanna and Taylor talked with attendees about Blaze (male kestrel) and Silva (barred owl) as those were two species being released at the park that day. Not only did we release a male and female kestrel and two barred owls, but also two screech owls. Taylor (with Blaze, education kestrel) and Savanna talk with folks at the 2018 SOAR Release Party at McFarland Park, north of Ames, Iowa, on 26 August 2018. During the afternoon, we listened to Story County Conservation director, Mike Cox, talk about the areas managed by the conservation board. Mike also talked about the new county rule voted on by board members that makes all Story County managed hunting areas non-toxic ammunition only beginning this upcoming hunting season. Also with us for the afternoon was Ryan Anthony with the US Fish and Wildlife Service Illinois-Iowa Field Office. Ryan shared with us the Midwest bald eagle telemetry work that the field office has been conducting with many partners. He talked about the massive movements that many bald eagles make during the year and also the goals of the project to learn more about how bald eagles use the landscape. Our musical backdrop again this year was provided by the Fabulous Irregulars from the greater Cedar Falls area. The multi-purpose room in the center has wonderful acoustics! If you want to hear more from the Fabulous Irregulars, check them out on Facebook. To those that helped release the ready raptors, thank you! Teresa and Linda, the screech owls; Shanda and Cathy, the kestrels; plus Jo and Tianna, the barred owls. Thanks to our friends and supporters for making this day possible. See you next year for our 20th Anniversary and release!